U.S. Dept. of Health and Human Services, Substance Abuse and Mental Health Services Administration, Center for Substance Abuse Treatment, 2005. Best Bet: Credo Reference provides articles from over 600 titles with particular emphasis on encyclopedias, dictionaries, atlases, and reference handbooks. CQ Researcher provides in-depth coverage of the most important issues of the day. African American Experience (ABC-CLIO) Developed with the guidance of African American librarians and subject specialists, The African American Experience is the widest ranging and easiest-to-use online database collection on African American history and culture. You can search Discover! 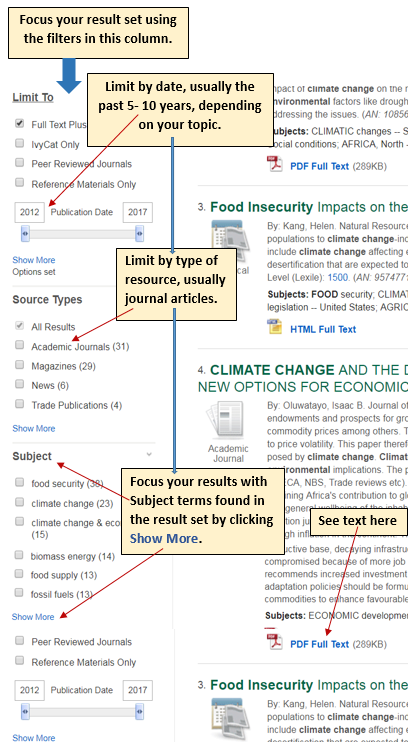 to finds book and articles on your topic from one search box. Discover! searches both IvyCat (a database of all the materials in the South Bend and Elkhart libraries, including over 100,000 ebooks) and all our EBSCOand JSTOR databases for articles and books on your topic. You can link out to ProQuest Research Library and other databases from Discover! to find more information (see right column of your result set) on your topic. 1. Enter your term(s) in the search box. 2. Focus your search by adding terminology. ProQuest Research Library, like Academic Search Premier, is a general academic database. However, it is very strong in the social sciences and a must-use database for research in the social sciences. The same searching principles apply, though the layout is a bit different. You can access ProQuest by linking out from a search in Discover! (see above), from the A-Z List on the library home page, or by clicking here. 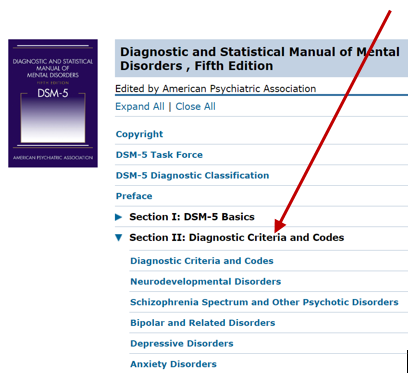 The DSM-5 is your first stop for information about psychological conditions. Select DSM-5 from the menu. On the next screen, click on the blue arrow next to Section II: Diagnostic Criteria and Codes and select the condition your are researching.